When I look back over the past 21 years, it is amazing to see how God has grown my faith, especially during the difficulties of the past few years. For my kiddos, and anyone else that is interested, I want to sort through those years and be prepared to give a reason for the new hope that I have. SADLY, many medical professionals discourage parents from seeking hyperbaric oxygen therapy for their children. This blog is set up with the hopes that other parents will see the validity of the treatments. While I am a huge believer in hyperbarics, I'm an even bigger believer in The Great Physician - The One who gives the Breath of Life. And what better place to receive that gift than in a treatment that bascially involves breathing. Below you can follow along with us as we see and report on Ryan's continued progress while completing therapy at Hyperbaric Therapy of the Lowcountry. A lot has happened since the last post. 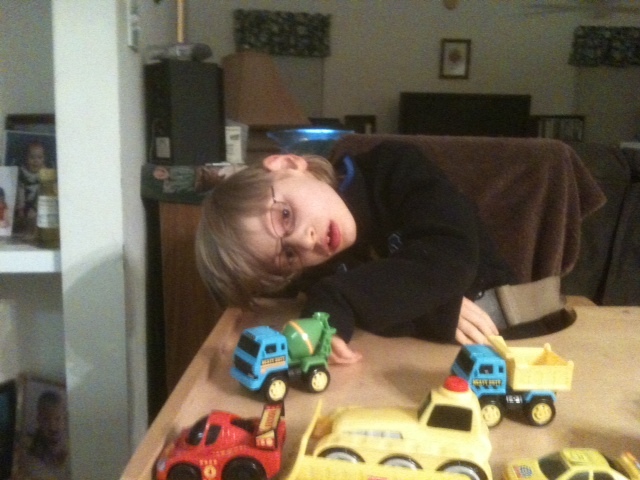 There have been some tough times where seizures returned due to an inability to obtain HBOT for Ryan. But, just as God promises in Romans 8:28, all of the tough times have led to some positive changes. 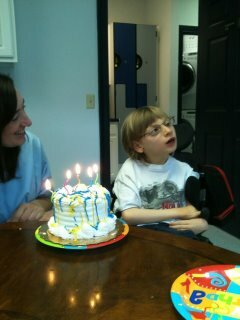 We've maintained a log that details any seizures that Ryan has, along with the hyperbaric oxygen treatments received. Thanks to the log, we were able to clearly show the correlation between HBOT and seizure control. During periods of time when dives were not available seizures returned. If there was a prolonged delay in getting services, Ryan's seizures continued to escalate in volume, intensity, and length. As soon as we returned for more dives, they stopped. The evidence was so compelling that we appealed the denial of services and won. The conditions of the appeal include an additional review for continued coverage after 6 months, January 2015. We are to complete another EEG in December and provide the results for review in January. Ryan is doing well and enjoying school with his friends. He has a best friend, Evan, and they are quite the pair. He actually has a posse. He is the only one in a wheelchair and all of his classmates want to help push him, so you will often find him with 4 boys surrounding him as they head to the bus. Recently, we have found some great success with sleepless nights and breakthrough seizures through Young Living Essential Oils. This Momma is thrilled that we can all sleep through the night. Praise God! If you would like more information on our success you can follow that journey on this blog as well or email me at AnitaHowell2014@gmail.com. Also, we are working on Camp Smiles for children with Cerebral Palsy in our area. You can find out more about Camp Smiles on Facebook at CampSmilesCCU. Big Boy!!! 8 Years Old and Attentively Watching Mr. Richard Sing. Well a couple of busy weeks with bad news….good news…..more good news. I’ll certainly take that ratio of good to bad. Ryan started having some new seizure activity last week. They were looking different, which I’m told is common since it depends on which part of the brain is experiencing the seizure. None were more than a minute and were relatively mild but the trend towards increasing intensity and frequency was concerning. We also started seeing him become dizzy with quick movements…..my child loves rough housing, swinging, and rocking fast so that was a big change. We were also seeing his body become more symmetrical where, because of the damage on the right side of his brain, we had previously seen much less movement on the left side of his body. Long story short (I know…too late) it is sounding as if the right hemisphere of his brain may be communicating more with the left hemisphere, which is a good thing. Since we can’t let the seizures go untreated for fear of losing some of his gains, neurology recommended that we get him back to the hyperbarics clinic as soon as possible. The improvements we are seeing were well worth having little man spend his 8th birthday at the Hyperbaric Therapy of the Lowcountry. 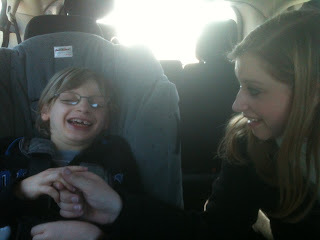 He was quite happy – of course, having Emily there with us made his day. We took him to see The Lorax after his dives on his birthday and he had a great time. When everyone sang “Happy Birthday” to him he signed “more” when we stopped so we sang it again. Ow, and he has always struggled with gluten. Dr. Pete suggested that we try it again since HBOT often helps with gluten issues. We started out with a little oatmeal and the last few days he has had a full bowl of oatmeal for breakfast with strawberries and blueberries in it. No issues!! YEP!!!!!! 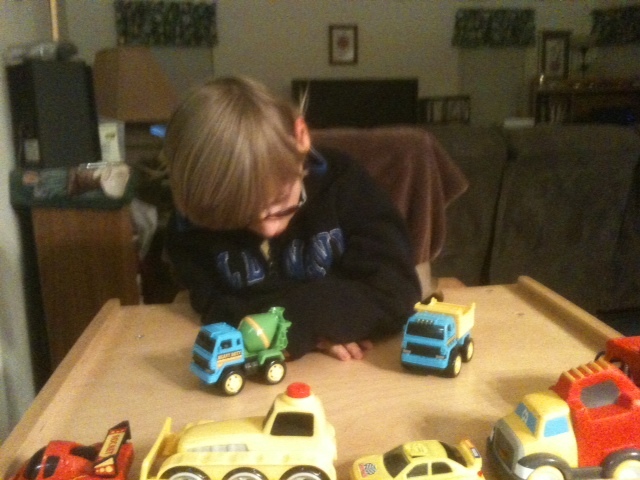 He is pushing the truck across his tray!!!! He is doing absolutely amazing. I guess time flies when you are having fun because I can't believe how long it has been since our last post. We had 8 more dives the second week of February. 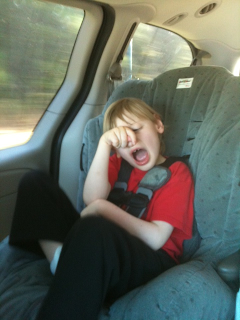 Typically he focuses on one area during our trips like attending visually, moving, or attempting new vocal sounds. He was doing all of them this trip! Dr. Pete and Mr. Brian both commented on how different he seems. Much of my delay in posting has been in trying to figure out how to explain the excitement that we have. Of course, now we have the above pictures showing him pushing the truck.....this displays a ton of motor planning and processing. It is huge for him. The part that is difficult to explain is the thoughtful looks that he has. Communication has gotten easier because when we go through the list of possibilities on what he wants or needs he laughs or smiles when we get to what he wants. If he doesn't want it, he looks away and frowns. All of that, of course, lessens his frustration and makes a huge impact on his quality of life and motivation at attempting new things. He is continually trying new sounds. Though his favorite and strongest sound remains, "EYE!!!!" with a tone of sarcasm at our lack of wisdom in thinking he could possibly see without them. He is also continually working on, "I ove ou." Some days it is harder for him to say than others but even the attempt on an off day melts this Momma's heart. He is getting so strong in his trunk and those tendons are starting to have some "bounce" to them as Ms Tammy would say. We also have to give a huge thank you to Ms Lisa and Miss Lizzie for giving him his new seat. He loves it and it gives him time to think about what is on his tray and decide what to do. Thank you!!!! We love you!!! He had a wonderful time with big sis Emily and big brother Caleb this weekend. They built a tent fort in the living room for their "Finding Nemo" movie night and plopped Ryan right between them. He had a blast!! I am so blessed!!! He displayed a lot of interest in Ms Dina's iPad during OT this week. We are requesting funding for that through the insurance company this month. Please pray for favor. Some of the communication apps would be excellent for him and far cheaper than a Dynavox. Thank you for checking in on our little guy. We all feel like huge things are coming.....and we are already seeing them!! God is so so good!!!!! Our little humorous man. Today he was quite demanding of his sister's attention. He would pretend to fuss until she turned and talked to him. Also, he has started holding his hand over his eye and saying, in one very long word, "eyeeyeeyeeyeeyeeyeeye....." when he wants his glasses on. OW!!! And this very happy mom has been able to sleep allllllll the way through the night uninterrupted for 4 nights straight!!!! It is absolutely heavenly!!!! He is so content lately and lots of fun!! We returned Saturday from a week of dives. It was an extremely tough week, since Ryan and I both had a horrible bug. Even when we aren’t sick, completing two dives a day can be very tiring. But it has been well worth it!! On our last day, I was telling Dr. Pete that Ryan just seemed depressed and homesick. He thought that was a good sign. If he didn’t care he may be less aware, less alert. As soon as we hit the road home he crashed and slept for an hour. When he woke up, he looked around and was just beaming with excitement. He knew that we were headed home. When we reached about 5 miles from home he started belly rolling laughing. It was such a complete turn-around from being lethargic and disengaged. Once we got home and settled in with Dad, Emily, and Caleb, we started watching Fear Factor….I know, I’m not proud of it but we do like to watch that show for some reason. Ryan was turned facing me and as they started working with snakes I was trying my best not to make squeals that might scare him. I did gasp quite a few times and cover my eyes. Then I heard Ryan making a gasping noise. He would quickly bop himself in the face and cover one of his eyes as he gasped. It dawned on me that he was copying me!!!! We paused the TV and he continued to do that for quite a few minutes while we all laughed at him. For those unfamiliar with terminology like “cognitive delay,” that means he was mimicking, which is a wonderful milestone in the cognitive area!!!!! Huge! In addition to that, he WANTS to wear his glasses again and he wants lots of visual stimulation! 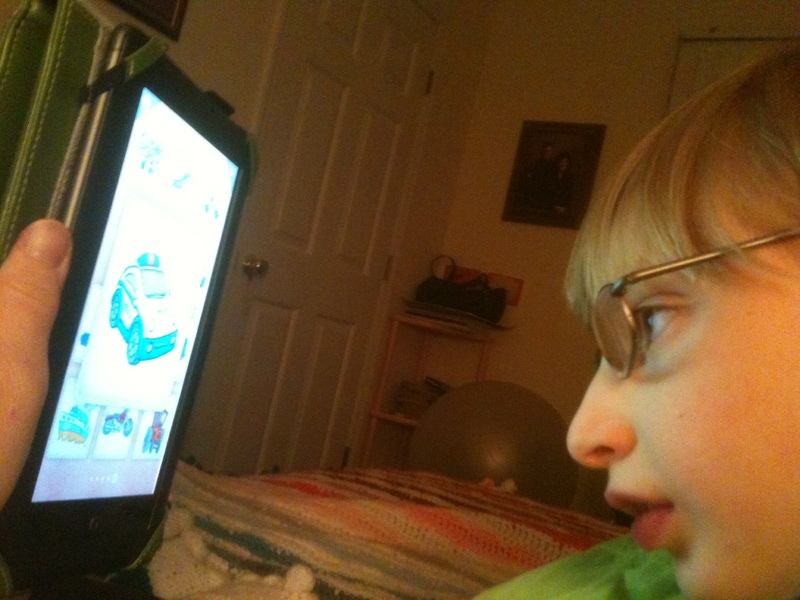 Last night as we were going to bed I started showing him some flashcards on my Nook. He loved it and stared intently for at least an hour. Now it is time to buckle down and work on grant requests for a Nook Tablet or iPad. Let me know if you come across any!! It is absolutely thrilling that he is now ready for that step!! He is so frustrated with not being able to clearly communicate, which could prove to be a huge motivator for him. You have to love technology that replaces $7,000 communication devices. What an amazing difference since my last post. We’ve known that the more recent dive sessions seemed to be showing more of a difference in cognitive progress than before but it was hard to put into words. 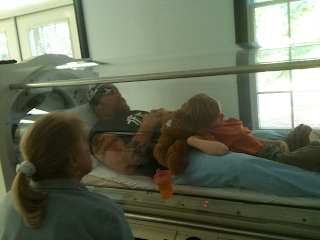 We just had to wait it out since Ryan isn’t receiving HBOT for rehabilitative purposes (re-learning what he lost). He is receiving HBOT to move into unchartered territory for his little mind and body. He is seeing, learning, thinking, and developing in ways we haven’t seen in the past. I said it before and I’ll say it again, God love the potato farmers who have the faith to continue to believe without being able to physically see their harvest. And I praise God for my little spud!!! Hi Everyone. Well we've had a rough week or so. Ryan began to have some seizure activity again, or at least that is what they appear to be. This time though they seemed to be affecting his vision. 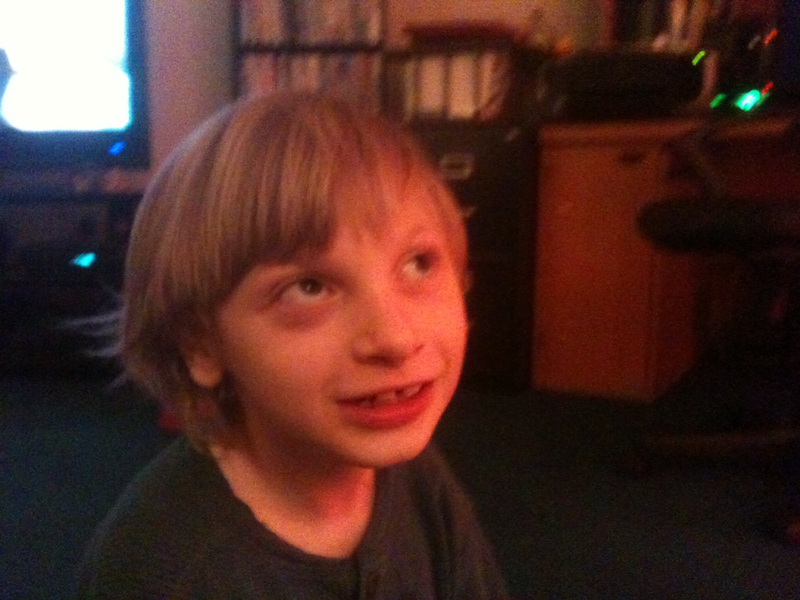 After months of seeing little to no nystagmus, it went to being the worst that I'd ever seen in him. He couldn't fixate on anything. He would only look in my general direction. After a scare with waiting on his eyes to dilate and the doctor to determine if and how much vision had been lost - and calling our wonderful South Strand Family to be praying, we found that he has lost little to no vision. In fact, his glasses were too strong and they have ordered another pair. We finally found out what we believe the culprit to be.....an increase in Prevacid. I don't mean to scare anyone using it so remember that for a child with significant brain trauma everything is riskier. Ryan and God have a way of letting us know. I sat down to feed him and broke his Prevacid up in his food. He looked at the bowl, covered his eyes, and started whining. The Aha light went off. These changes had all stared around the time we had increased his Prevacid. I Googled "Prevacid side effects" and found that in severe reactions both seizures and visional changes were listed. Dr. Pete agreed that we should take him off and see how he does. Sure enough, things seems to be a good bit better. Now we're working on some natural remedies for reflux. There is just no way that we would ever be able to put all of the pieces to the Ryan puzzle together without God's help!!! Thank you Lord for your direction and wisdom!! Thank you that you still speak!! Please pray for a safe trip. We will be getting in 12 - 14 dives shortly. I just love the season of hope!!!!! Today on the way to speech we were listening to KLove and Phil Wickahm's worship song, "Yahweh, Yahweh" was playing. Throughout the song he sings, "Yahweh Yahweh" over and over. Ryan piped up and sang, with a grin, "Yahweh Yahweh." That kid really loves praise and worship. When he is looking up singing during worship songs with this look of awe I realize that I am the one that is visually impaired. Wonderful updates this week!! I received a phone call from a Beach Buddy (Beach Buddies are members of our church's special needs ministry team.) Mr. Dave was so excited to tell me what Ryan had done during the large group time. They were asking the kids who loved them and the kids were all shouting, "God!!!" Ryan piped up and shouted, "God!" right along with them!!! Then we put up our Christmas tree Thanksgiving. 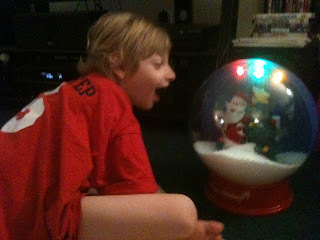 This year he was completely mesmerized by it!!! He sat like this for 35 minutes just staring, smiling, and "chatting." It was so cute to watch him keep scanning from top to bottom. I hope our neighbors don't mind a Christmas tree in July because it is staying up until it no longer has this impact on him. I want to be as open and honest as I can with our journey for those who are contemplating HBOT. At the same time I have to be careful that I don't post anything that we haven't discussed with our college kiddo. She was home this week and we caught up with some struggles that we were experiencing over the last couple of weeks. Ryan caught a cold and is trying to cut some molars. Due to the overwhelming pain from his molars he was not as willing to let me stretch him during our last round of hyperbarics. We also noticed two staring off episodes. The episodes were less than one minute and he was not fatigued or stressed afterwards. During that time he seemed to be regressing in his speech; HOWEVER, once we figured out the molar issue and took care of that pain he began chatting even more than ever and we have not seen any more episodes. Friday night Ryan seemed to be having leg cramps and was in a great deal of pain. His physical therapist believes that it is due to a recent growth spurt. After some research, I found that calcium deficiencies can lead to leg cramps and I know that I have not been getting enough calcium in him. We have gotten back on track with calcium supplements, stretching at night, and nightly warm baths. That seems to be taking care of it and he even laughs after the stretches and says in his southern draw, "agin." During the short-lived phase of the molar pain tears and two staring off episodes, I must admit that I felt that constant underlying dread followed by lots of "what-ifs." I just kept thinking about how our history with Ryan seems to be that of a few neurological hiccups and then a giant leap forward. We are, thankfully, in that giant leap forward. Ahhh, one day he will get me for this. Unless you've been in our shoes, some of this may seem silly. There is such an increase in communication but it can be difficult to put into words. 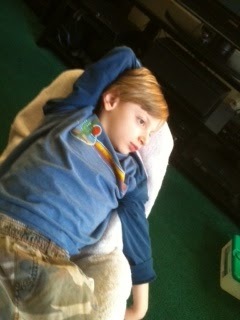 He has more of the "looks" that a Momma knows and instantly gets what he is trying to communicate, like yesterday. He was home sick. I put him in the tub and he started complaining a little. I asked if he wanted bubbles and he leaned his head forward as if to stare a hole in the button that controls the jets on the tub. There IEP Team! Stick that in your "cause and effect" pipe and smoke it. 1) He could SEE the button. 2) He knew that it controlled the bubbles. 3) He processed my question. And 4) he processed and gave a response! Ryan enjoying and clutching onto my Nook. He really likes the new Dr. Seuss stories that read to him. Even on our way home from a sick visit at the doctors' office he is still very alert. He has a cold but is handling it so much better than he would have a couple of years ago. I realized this past Sunday that he is also using his "more" sign for "yes." I was fixing his eggs and he yelled Ya ya. I rushed in so I could brag on him for calling me the correct way rather than fussing. He immediately started signing "all done." I asked if he was all done with the bed and he grinned and "clapped" to indicate yes. I'm surprised at how alert he is with cutting two bottom molars and fighting a cold. I had mentioned to his physical therapist that he wouldn't let me stretch him in the chamber as much this time. We realized that he was cutting two bottom molars and she felt that was his way of saying, "I can't handle one more thing right now." RYAN'S MOST FUN HALLOWEEN EVER!! 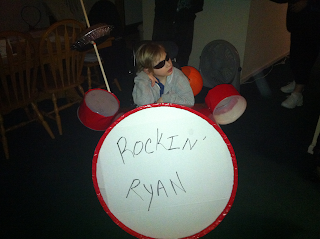 Ryan laughed through the neighborhood and everyone loved his costume and this year he gets to eat candy!!! He looks a little bored below but he was getting tired of waiting for us to have it all attached to his wheelchair. But he was so proud when we made our way through the neighorhood. He has been VERY verbal! Saturday I was brushing his hair and didn't realize that he had something in his hair. When the brush pulled his hair he loudly said, "Ooowwwwww." Then Sunday I was going through the flash cards on my phone. We were on the set with colors. When the woman said, "white" Ryan quickly said white. 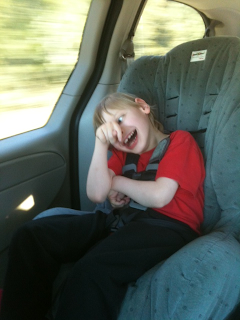 He is fairly regularly waving bye to his friends or teachers at school. Excellent updates!! We just finished 10 more dives this past Monday. We had gone 8 weeks in between sessions and Dr. Pete feels that we are seeing such good progress that he would really like for us to come back much sooner than 8 weeks, if possible. Ryan laughs and has a blast in the chamber. It seems like as soon as the oxygen starts he gets a sudden burst of energy. He has also begun to make this cheesy goofy grin. When we acknowledge it and laugh he does it even more. His little sense of humor is coming out more and more and provides lots of entertainment. He was so happy after his last dive that he had praise and worship for about an hour on the way home. He most loves the songs with ooooo’s and aahhhh’s because they are easier for him to join in. He is quite the little back-up singer for Hillsong these days. He is also laughing at silly lines in books. Before he would laugh at words that he thought was funny but now he laughs at silly sentences. He has had some wonderful improvements in communication. After art class yesterday the kids were all saying bye to the teacher and Ryan said, “Bye, bye.” He really surprised the teacher. Last week, he also threw up his hand to wave bye to the assistant that has been working with him. Brandee, his speech therapist, has been working with him weekly with “yes” and “no” cards. Yesterday he was tired and grumpy during speech so he was signing “all done.” She asked him, “Do you want the music off, yes or no?” He grumbled and continued signing “all done.” She explained to him that he would be able to decide more things if he started using yes and no. She said, “Just one more time Ryan. Do you want the music off, yes or no?” He looked and nodded towards yes. This morning he had already said, “eat” so I used to communication board to reinforce it. He scanned between the two and leaned forward toward the “yes” when asked if he wanted to eat. I know it sounds silly to use the board for something that he has already communicated but it helps us prove that he is responding appropriately and reinforces the use of yes and no. As an added benefit, the dives are also helping my joints and arthritis. My pain level dropped significantly after a couple days of diving. And on a funny note, the trips seem to be good for our van. In December we were told that our van has a cracked head gasket and that we shouldn’t take it on long trips because it could leave us stranded. Since then we have been to Hilton Head three times, Clover once, and Columbia three times. Oddly enough, it seems to perform better after the long trips……and I perform better without a big ole car payment. ; ) I’ve grown quite fond of that little green van that continually reminds me that with God all things are possible. Wowwie, wow, wow, WOW!!!!!!! Go my baby!!! Wow, wow, wow. What a wonderful morning. Ignore the early morning bed heads but Ryan held this position strong for 4 to 5 minutes. I actually timed it by the clock. Funny thing, he pulled his body up strong and was about to plop on me until I yelled, "Emilyyyyyy!!" He quickly stood back up so his sister, and favorite person in the world, could see him. Even after the 4-5 minutes he would push to stand back up. Of course, each time his muscles were closer and closer to being maxed out so the time lessened with each stand. By the end, I could feel his little muscles shaking from trying so hard! Excellent job Ryan!!!! In the picture below, Ryan actually was so relaxed that he stretched his own arm above his head. A far cry from the little guy who most enjoyed the fetal position. After a couple of delays, it looks good for us to head back for more HBOT in a couple of weeks. Daddio may even be able to join us!!!! I'll definitely send pictures of his Daddio in the dive with him. God is AMAZZZZZZZINNG!! If you only knew the journey my heart has taken from hopelessly fearful and depressed to AAAAAAAAAAAA!! I may have to work on those words a little longer. My heart is just completely overwhelmed with the faithfulness of a God that put up with my anger and bitterness and still brought me through to Jeremiah 29:11! Thank you all for your prayers and support! OW AND STILL SEIZURE FREE!!!!!!!! Monitoring Ryan’s stimulation is doing the trick. I’ve picked him up from school early a couple of days and he is going to bed earlier. 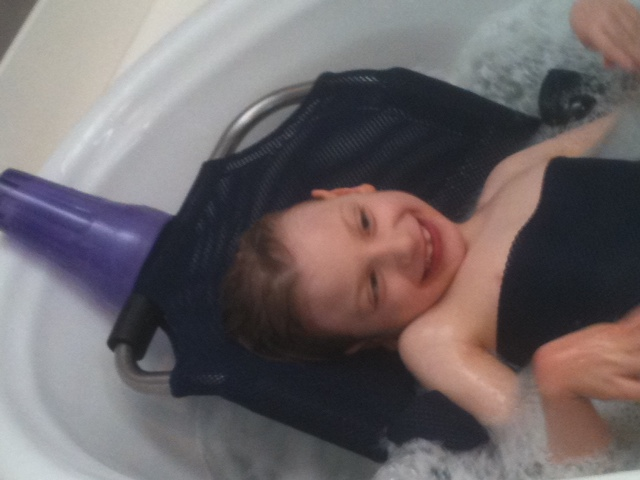 We have a very typical kid routine at night that is a welcomed relief!! He goes to bed by himself and we leave the lights on all night. He isn’t scared of bedtime anymore. He actually cried to go to bed last Thursday. I wanted him to eat again but he wanted to go to bed. He won. Cognitive improvements still seem to be the biggest improvement. He has this very studious look on his face when we engage him in activities or conversations. He is making more eye contact and is very attentive for long explanations, unless I’m correcting him in which case he starts signing, “all done.” He is done with hearing my junk. Wes and I were playing a little game with him where we were taking turns saying, “No, I love him.” He would anticipate the next turn and turn his attention appropriately. Now when he starts signing, “all done” I’ll take his hands and put them on his lap and say, “I heard you. You are all done with the book. No more reading.” He gets this huge grin on his face like he is proud and relieved that he has successfully communicated his feelings. We have some flash cards to use to talk about emotions since the communication barrier is a huge frustration for him. He LOVES the cards. He studies each face as we talk about what the child is feeling and why they may be feeling that way. He smiles with those who are silly and laughing and looks concerned over those who are crying or sad and typically signs, “all done” much quicker on the sad ones. Saturday and Sunday he let me stretch him with his knee immobilizers and AFO’s for about 90 minutes. It is painful but he recognizes that it makes him feel better afterwards and he does a great job of tolerating it. Counting down on each stretch makes him feel less out of control and more cooperative. We’ve had to delay the next HBOT round a couple of weeks due to poor planning on my part. I think it may be for the best though because he will have more time to solidify his new heavenly bedtime schedule. He is doing a great job of eating and drinking and looks the healthiest that I’ve ever seen him. His eyes are bright and skin color is very healthy! Ryan has had such a significant improvement in his vision that we are going to have to be careful to provide breaks from all of the stimulation. I hadn’t really thought about how taxing it could be on his little brain to process all of the new information. Over the last 5 days, he hits overload sometime between 5 and 7 and has a complete meltdown with lots of tears and frustration. He also had a few restless nights where we all had very little sleep….rough week. But ultimately all of it will be very good for him in the long run. We just need to learn to monitor for overstimulation. The last few days at school he has stayed in his stander for 40 – 45 minutes without complaining. At home, he let me put his knee immobilizers on Saturday and stretch him off and on for almost an hour. He makes a face like he is feeling discomfort but doesn’t cry as long as I count to 10 so that he knows how long he has left in each stretch. Please pray that God will give us wisdom in accommodating all of the changes that his body and brain are going through. It can be tough to sort through with his limited vocabulary. Of course, an increased vocabulary would be good too. Thank you all for following his progress and especially for your prayers. Ryan had an excellent speech session Tuesday. We have decided on the sign for "call Emily." It is Ryan bringing his right hand to his right ear. When teaching him a new sign we have to respond to his request quickly so that he knows that it is worth his effort. So, we had Emily call and leave him a voice message on my phone. Now when he starts grumbling and signing "all done" as in all done with Emily being gone, we are doing hand over hand to sign call Emily. While we were practicing he actually said, "all" for call. And signed and said, "again" several times. He also said, "N E" with his face lighting up all the while. 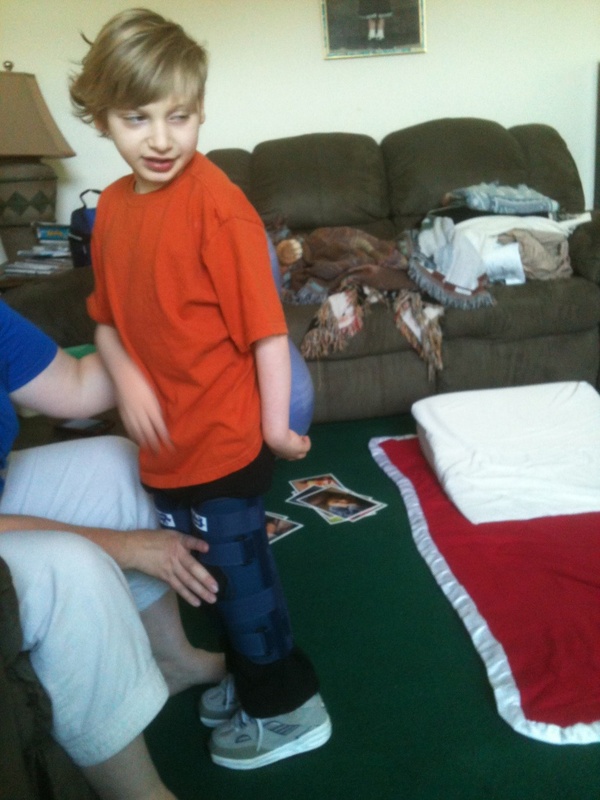 Today he lasted in his stander for 40 minutes at school without complaining. He was having fun with music. He is having a little trouble with being afraid of the dark so we've had a few sleepless nights. Please pray. Tonight we left his light on and he is currently sleeping peacefully. We are going through some growing pains. With increased cognitive understanding comes a greater will and a greater level of stubbornness. Ryan has been getting frustrated with our not understanding what he wants. However, he is trying to communicate more. He also listens more intently now when I'm trying to logically talk to him about whatever has just ticked him off. We have found that part of his frustration is with his sister not being home so we are working on a sign for "Call Emily." I held up my phone with a picture of Emily and Caleb (her boyfriend). I asked Ryan who it was. He looked at the phone, tilted his head sideways (to find a better field of vision) and said, "N E." A little while later I did the same thing and grinned and worked his little heart out at find a good field of vision to better see his favorite person in the world, his rocking sister. I would like to stress that it was the picture on my phone.....a small picture!! People have asked if I have felt a difference in how I feel since I'm going through the treatments with Ryan. For a while I wondered why I was so exhausted and sore since I also now get pure oxygen during the treatments. Then I realized that while I'm there I'm lifting his wheelchair from 8 to 14 times a day and my 49 pound little man more than that. So, since I'm basically in a weight training program while I'm there I may not be the best person to ask about my own personal experience. On a good note, he is my own built in little weight training program. I can hold him longer than most men in the family.....whimps. : ) Just kidding. While at my neice's birthday party I needed something off of the table and Ryan was on my lap. Rather than get up, I reached out with one hand and slowly pulled the table over to me. I didn't think much about it until my neice, Star, said, "Dang Aunt Nita!" Ryan's energy continues to be good after school; I'm even able to do his homework (reading) with him without his having a stimulation overload meltdown. Some changes aren't exciting changes to shout about but still good nonetheless. Now when I'm trying to wash his face or brush his hair he is better able to push my hand away......with attitude. Whew we may need Super Nanny once he is able to replace his grumbling with words. Even without meds or the diet, he is still seizure free and has been since mid-August!! He is still trying lots of knew foods. I think the most fun changes that we are seeing with Ryan this time around is the increase in his stamina, cognitive understanding, and social interaction. Those things are all bringing out so much more of his cute little personality. In the pictures you can see Ryan expressing his desire for more attention from his cousin, Kerrington. He was tapping his left hand with his right hand, which is his sign for "more" and staring intently at her so we knew exactly what he wanted more of. When she would start looking at her stamp collection he would squeal, stare at her, and sign "more." Kerrington always graciously provided more attention; we love you sweet Kerrington!!!! 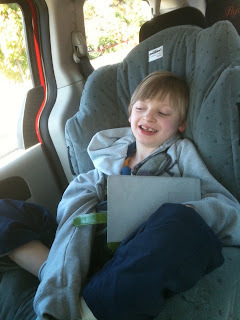 During our trip he was able to handle extra stimulation better than he ever has in the past. And when my sister came home (we were there with Emily watching the girls) she started playing a "time to play, time to sleep" game with him. He actually began to mimic her and pretend to sleep when she did and get excited when it was time to play (tickle.) He even remembered it a couple of days later after we got home because as soon as I would say "time to play, time to sleep" he would start laughing. Thank you Aunt D!!!! Another change we started to notice recently is his decrease in fatigue at the end of the day. At the end of last year he was completely exhausted at the end of the school day. We even had to cancel OT once because she just didn't want to push him further. Now he is tired but still happy, attentive, and alert. We are even staying after school on Thursdays for a music lesson. He loves it. He loves hearing music, dancing, and singing. He makes an excellent ooooo, ahhhhhhh, back-up singer. Probably Ryan's favorite communicate ever has been in displaying his "disgruntled" feelings at being away from his favorite person in the world, his sister, Emily. This week his speech therapist, Brandee, said that he was signing all done and grumbling. She kept going through everything she could think of trying to figure out what he was all done with. When she said, "Are you all done with Emily being gone (to college)?" he said, "uh huh." She said, "Do you want me to tell Mom to call Emily when she comes back?" He grinned and with a smile said, "UH HUH." We let him call her for a quick 1 - 2 minute call each night at bedtime now for a special goodnight from his "Sissy." I'm sorry for the delay in posting. When school is out things get kind of hectic. We just returned from an 8 dive session Sunday. He is doing great! Both of the pictures below were taken after his June HBOT session. What amazed me though was in looking at his sad face during the hospital visit and realizing how little we see that face now. That has been the biggest comment from friends and family. They say that he just looks so much more content and happy. He is still seizure free and during the last 8 dives he was continually watching the things going on outside of the chamber. He was even watching the tv. Plus, very few tears during the drive there and the drive home. He is loving school and very focused visually. OWWWWW, and he starts his first extracurricular activity tomorrow!! He has been clapping and singing his little heart out so Ms Kline has graciously agreed to do music lessons with him. We aren't sure exactly what that will look like yet other than FUN!!! His appetite is still improving and he continues to be open to trying new foods. We will be doing 10 dives monthly and expect to return either late September or maybe early October. It is so exciting to see how he progresses in school with being able to have that stimulation so quickly after HBOT sessions. God bless!!!! DAY 7 OF BEING SEIZURE AND DIET FREE!! PRAISE GOD! We’ve come through a rough time but things are amazingly better than I think they have been in a long time!! In the past week, God has once again shown Himself true to Romans 8:28. It has been a reminder that, as much potential as HBOT has, it really is about the healing power of the One who gives the Breath of Life. ….of course, still a big fan of HBOT, just a gigantic fan of my God. A set-back (nausea, dehydration, and low potassium) led to a short stay in the hospital, but it gave us another invaluable piece to the Ryan puzzle – nutritional deficits. 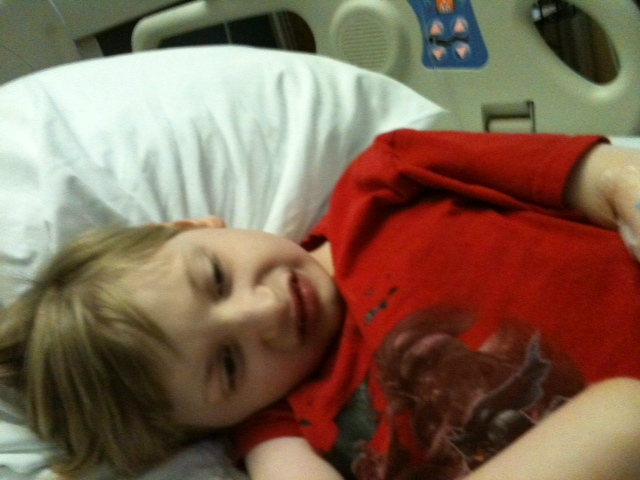 Without the hospital trip Ryan would still be on the diet and would still be nutritionally deficient. I strongly feel that Ryan’s nutritional deficiencies made him more susceptible to seizure activity. Time will tell. We had to take him off of the diet to get his potassium and other blood work straightened out and we have not noticed one seizure since then. God love the parents who work so diligently at executing the Adkins and Keto Diets. My child just will not cooperate and can quite easily go on a hunger strike for days and refuse to take in the required fluids. I think that Ryan’s nutrition must have been compromised even during his HBOT. I’m excited to see what proper nutrition along with HBOT can do for him. In talking with Dr. Pete, we feel that we should begin our monthly dives this month rather than waiting until September. We know that it stopped the seizures for nine months after the first round and it stopped them for several weeks after the second. So, we are hopeful that we can keep them under control by correcting his diet and continuing monthly treatments. Currently, I have not seen one seizure since coming off of the diet. Today Ryan looks the best that we’ve ever seen him. He is active, attentive, and showing more expression daily. Ryan had stopped trying to talk as much. We think that was because his front two teeth were coming in and possibly the nutritional issues. 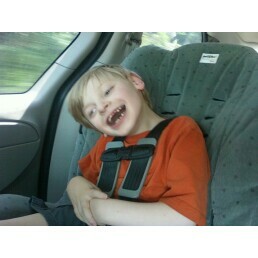 Once he lost those two front teeth and his mouth starting feeling better he began babbling again. While we were visiting family my sister was talking to him and bragging on him and he said, “I ove ouuuuu.” This was completely spontaneous and was not in response to someone saying it to him first!!! A few minutes later he said it again in response to my sister saying she loved him. He was very proud of himself. It is so funny to watch him speak. He looks like a little puppet, as if bobbing his head helps in the speech process. Ahhh, our little Kermit. He is showing more and more interest in music and sings constantly when he hears music. His stomach aches are better. He is trying new foods with no complaints. To date: sweet potatoes, bananas, and BROCOLLI. And I have a Ninja Food Processor on the way to add as much nutritional value as possible! Thank you all for your prayers and for checking in on our little guy! Check out these beautiful little wrists!! That was his natural position while swinging. There is still some tightness to work out of lefty but it is still much better. For the difference, scroll down and look at his wrists in previous pictures. I haven't updated in a few days because we had a little set-back. 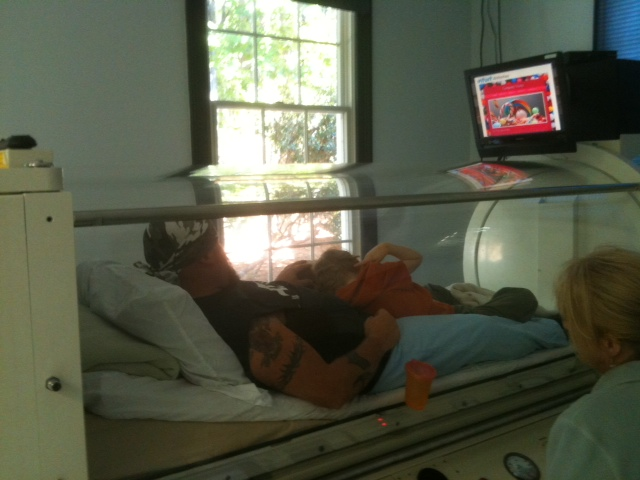 But I do feel like I have to share the good and the bad for parents considering HBOT. 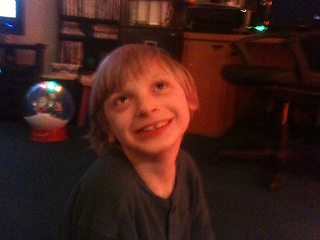 Ryan began to have breakthrough seizure activity last week. At first, it looked like we were losing some of the progress we had gained. He was "floppy", extremely tired, and seemed tighter. Sunday I witnessed the episode that confirmed what I had suspected - seizure activity. He woke up happy and energetic, ate, and then had some suspicious eye gazes, turned pale, and then slept. There was no doubt then that he had to go back on the diet. The good news though is that as soon as we had some ketones in his system the episodes came quickly under control and he regained his energy and attentiveness. Praise God we didn't lose anything that we had gained during this round of HBOT. We just have to, unfortunately, remain on the diet a little longer and I suppose we've been through far worse. On a good note, every single time that we have struggled with a time of seizure activity we seemed to lose some ground initially and then spring forward afterwards. .....looking forward to sharing the spring forward. Thank you all for your prayers!! I really think the cognitive changes seem to be far greater this round that the first round. When I talk with him he sits on my lap and stares at me with such a thoughtful look - along with a missing front tooth. The tooth fairy will be coming tonight. As I tell him, "I am so proud of you. You are aaaaamazing. You are so smart and work so hard. I'm so glad I'm your mom." He looks at me and cautiously and slowly grins as if to avoid interupting the flow compliments. His eyes seem to say, "Yea, what else." OW! And on the way to speech today he started clapping. He takes his right hand and hits his left to the music. Also, during speech as the songs and tempo changed so did his bobbing to the music. I'm so excited to see how things continue to improve with having monthly dives and no long lapse without treatments. Thank you for your prayers, emails, and comments!! Another wonderful day!! Emily and I took Ryan to see Zookeeper. He had a blast. He was sitting on my lap but kept leaning over into Emily's face and grinning to get her attention....it worked. 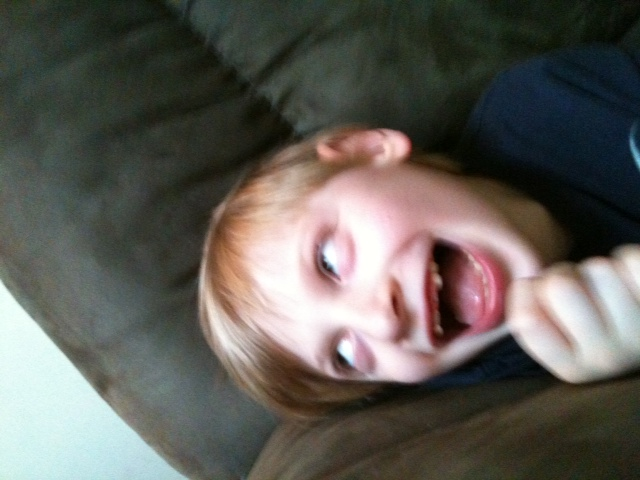 Every day he seems to show more and more personality with dancing, new laughs, and funny facial expressions. Now when he is rocking on the couch he will stop suddenly and lean his head back like he is giving me a "face hug." He knows what we are talking about when we say, "Do you want to go see a movie?" He starts laughing. I'm really having to change the way I talk to him.....he is not a baby anymore. We saw his optometrist and she said that his farsightedness had improved. Since his prescription has only changed by .25, he can easily continue using the current pair until we go through a few more months of dives. He has started wearing his glasses again and looks at things with such wonder. Dr. Tully said that at times his eyes may fatigue and he just may need a break from his glasses. She was pleased with his progress. It is still heavenly to wake up to Ryan laughing rather than a scream that would put a cat on the ceiling. Thank you God!!!! Thursday Ryan had so much fun with Ms Tammy, his PT, while standing facing the couch with a peanut ball for his arms to rest on. She was standing behind him and helping him remain standing. He was laughing so hard that he would almost flop over. She she pulled away from him you could see his muscles kick in to pull himself back towards the couch/ball. Yesterday I was doing that with him and he also continued to pull himself back up when I would pull back. Yay Ryan!!!!! Then twice last night as I was picking Ryan up he pushed up with his legs to help me!!!!!! Yay Ryan!!!!! Ryan is so much happier again. His crying had started back up again when the seizures returned this past April. That alone is worth every single dive!! He is more of a playful child than a cuddly baby. So glad that he still likes to cuddle at night though. He is dancing more and more.....until he falls over that is. He and Emily had fun "jamming out" to some music this morning while she was babysitting for me. He also has a new variety of laughs that we hadn't heard before. He will often do a "backward squeal" and then start laughing. Happy --> Characterized by or indicative of pleasure, contentment, or joy. Just saying happy didn't feel like enough of a description. ; ) For this Mom, that alone is enough to justify hyperbarics but we will thankfully take the seizure control, reduced contracture risk, improved vision, increased attentiveness, and anything else that is to come. What a good day!! For starters, his day started at 5:30 am with a belly rolling laugh for no known reason. Much MUCH better than the cries we had been waking up to for so long. He was able to sit up on his own for long periods before this last HBOT session; however, he heavily relied upon his arms to keep him up. Now he can sit up with either a light support of his arms or no support of his arms. While he was sitting there yesterday scissor style in the floor, I lifted up his knee to shift his balance and he quickly adjusted. Then I quickly let go of his knew and he leaned forward but caught his balance and corrected it. Now that he has better balance he has started this "dancing" thing. He shakes his head left to right to the music and even has his shoulders and bootie involved. In the video he was enjoying falling more than dancing. He saw his occupational therapist today and she said that she liked the tone in his legs and that he was definitely more alert than he was prior to the treatments. He seems to be comprehending so much more cognitively. Yesterday I told him that Mrs Tharpe, his teacher, was here and he looked over at the door waiting for her to come in. I told him she was still getting out of the car and told him to listen to see if we could here her door shut. He looked back at the window with his "listening" face until we heard the door shut and then laughed. He does love her!! Today is our first day at home, with the last of the 40 dives being completed yesterday. During our time in Hilton Head he did not want to do any of the activities that I brought with us. He just wanted to chill between dives, other than the stretching that he didn't seem to mind. Today I put him in his chair and sat his cheap talk on the tray. It has 4 buttons with messages from his friends. I noticed him hitting it over and over with ease. I sat up a little toggle switch that attaches to a radio, among other things. This switch is different in that he must hold the switch down to keep the radio on. Once he started to comprehend the idea he leaned in and stared at it and began to activate it with the back of his hand. Prior to HBOT, we were thinking that his head might be the only part of his body with enough accurate control to use for switches. The most exciting thing about this is that it demonstrates volitional movement. In other words, movement that he is intentionally doing to get an expected outcome. Without a display of volitional movements the school system is designed to begin lessening his expected potential. THIS IS HUGE!!!!!! Praise God!!!!! He is off of the Modified Adkins Diet and still seizure free. His digestive problems are gone. He is happier - a week ago my husband couldn't believe how relaxed he seemed. He did not notice anything outside of the chamber when we arrived even with glasses, now he is noticing the people not only beside of us but also in the chamber next to us. He is far more visually attentive than he was - off to the optometrist when we get home and will update. Cognitively he is handling correction and "waiting" better. He looks older and bigger - I believe because his posture is better and he is visually focused. We will miss Dr. Pete (Uncle Pete), Susan and Brian more than we can say....until September that is.